The Center Street Suite #1 is a lovely, centrally located spot to spend your vacation. At approximately 300 sq. ft., this suite is much bigger than most hotel rooms, has its own entrance from the street with a private patio area and is very quiet. The luxurious bath has a large walk-in shower, the bed is king sized, and the closets spacious. For your enjoyment a flat screen TV with cable and WIFI should fit the bill and the separate locked bike storage area will keep your valuable rides safe and secure. The mini kitchen has a fun, retro styled, fridge and microwave, plus a coffeemaker and dishes, enough for simple food prep if you don't feel like going out to one of our many great local eateries. Whether you want to visit the parks, participate in action sports, or just relax, this property is a hidden treasure. Need more room or is this condo rented at the time you want to visit? Check out the matching suite next door, HA#479168 and the larger condos in back, HA#367670 and HA#149341. While living in Moab from 1987 to 2018 I watched and helped this community change immensely. Besides Moab Trails Alliance, my other business was the walk-in camppark for tents only, Up the Creek Campground. There is no other campground like it in town. 132 E Center, AKA the Center Street Condos, is a unique property that was remodeled from a derelict building two blocks from Main Street. It houses 2 hotel style suites with outdoor patio seating on the the front side of the building and two deluxe and distinctly different condo properties in the back and their fantastic private oasis garden. This is where I stay when I'm in town and I love it! Everything in town is within walking or biking distance. The bed is super comfortable and the bathroom is wonderful! When you're ready, walk downtown and find your favorite restaurant. There are plenty to choose from, anything from sushi at Sabaku (Yes it is good!) to other fine dining including the Desert Bistro. The galleries are loaded with wonderful local artist's work, some of them internationally known, like Tom Till's photography or Serena Supplee's canyon scenes. The music festivals, classical or folk, are first class as well as any theater put on by the very talented local pool of actors. These events take place in historic Star Hall, right across the street from the Center Street Suites. Be sure to read the Moab Happenings for the month you will be visiting to not miss out! toilet, shower, Spacious custom bath, travertine shower. 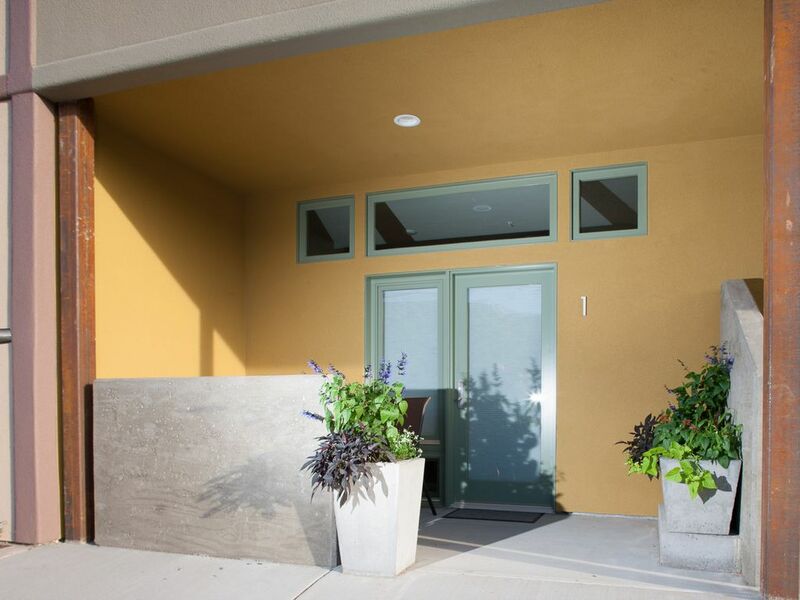 The Center Street Suites are located in the heart of downtown Moab in a very quiet location within walking distance of many restaurants, bars, shops, etc. Mitsubishi heating and cooling unit. 100% cotton, king sized sheets. On street parking is free and plentiful. Soft and comfy bamboo towels. The retro styled bar fridge is spacious and has a freezer compartment. Large capacity retro styled microwave makes zapping more fun. Dishes, silverware, and glasses are provided. The concrete counter tops with built in sink, along with coffee maker, dishes, and glassware, make it easy to fix a snack or pack a picnic lunch. A cafe table and two chairs facilitate inside dining and the outdoor patio also has a table and chairs. Bicycles are welcome and should be kept in the available (locked and secure) storage area. You will be given the combo upon arrival. The patio, with seating for two, provides a private corner, the perfect place to watch the world go by. This unit is not designed specifically for wheel chair access but there are no steps. Great location and just right. Clean updated condo, Central location perfect for couples stay. Manager was great to work with. Ideal condo, centrally located in Moab. A pleasure! This property is everything and more than expected! Great location, modern furnishings and easy in and out! The photo's do not do it justice. Being across the street from the police station gave me a sense of security as I was traveling as a single. I would not hesitate to return. Clean and very convenient to downtown. Had all the basic amenities needed. Hope to be back for a longer stay. The Center Street Condos are the perfect base camp for exploring Arches and Canyonlands National Parks, Dead Horse Point State Park, Monument Valley, Mesa Verde, Natural Bridges, Edge of the Cedars, and Hovenweep National Monuments, the Colorado River and many other beautiful attractions of southeastern Utah. Winter is a great time to visit these national treasures as the red rocks are spectacular with a dusting of snow! The nearby Manti-LaSal Mountains offer summertime mountain biking and hiking as well as cross country skiing on set tracks and backcountry powder runs in the winter. Check out Moab's new 18 hole Frisbee golf course too. The North Moab Recreation Areas Alternative Transportation System provides non-motorized paved paths and bridges to access the backcountry and parks north of the city. It is worth a day's activity to ride a bike from the condo to any number of these attractions. Contact us for fill ins and last minute deals!